Sharing Our Notebooks: Congratulations to Linda Booth Sweeney! Congratulations to Linda Booth Sweeney! Congratulations to Linda Booth Sweeney, winner of K.A. 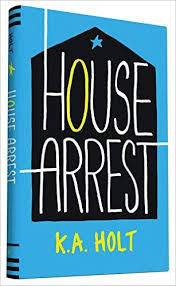 Holt's wonderful new book, HOUSE ARREST. Linda, please send me a message with your snail mail address, and I will send it along to Chronicle. Everyone - please don't miss K.A. 's great about her many kinds of notebooks and an idea to try too! You can find it HERE. Thank you so much, K.A. for giving us this peek. And thank you to Chronicle Books for the generous donation of HOUSE ARREST. Our next poster will be author and illustrator Peter Catalanotto, and I am tickled to be able to showcase his notebooks here...later today! Happy almost Thanksgiving! I am thankful to be part of this community.